There is something warm, wild and wonderful about modern desert décor. Whether you think of deep drylands, vast canyons or sand dunes as far as the eye can see, the colours are muted and earthy, full of terracotta, ochre, tan, rosette and sage. The result is a warm and worldly look, that embraces you and allows you to breathe. Enjoy the summer of 2019! A desert can seem a barren area, but in reality, there’s always a lot going on in colours, geology and plant and animal life. 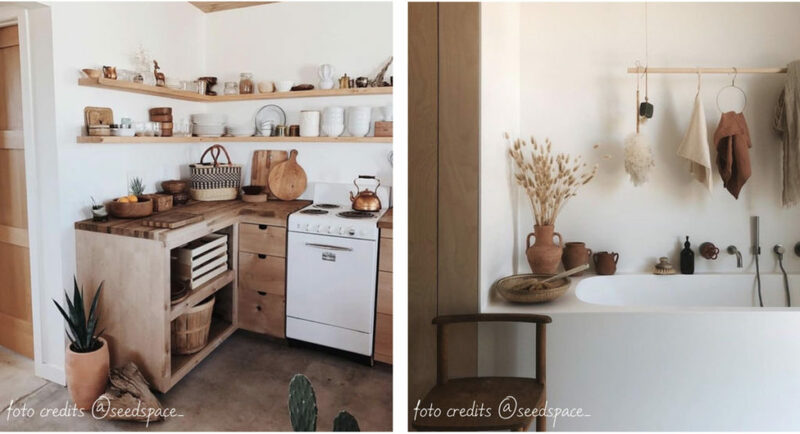 The modern desert décor trend by Mica Decorations captures the beauty of desert life in Chile, New Mexico and Arizona and also embraces influences from desert areas in Morocco, Jordan, Namibia and Australia. 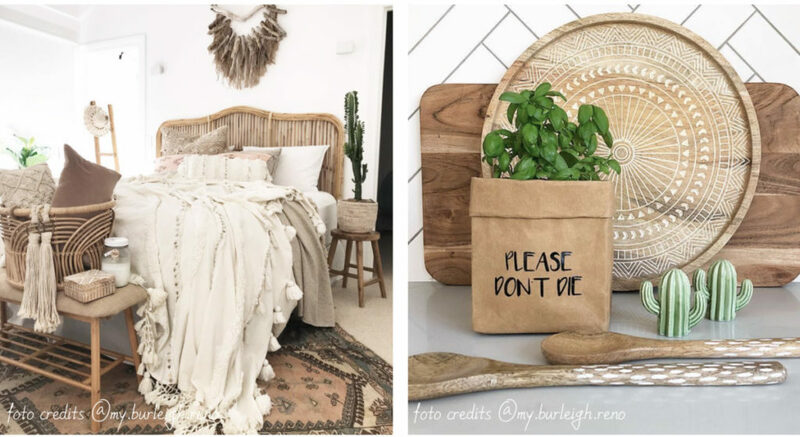 Think woven rugs, textiles and baskets, aged leather, kilims, robust ceramics and shining accents, all in strong earthy colours as old as time. For furniture think light and airy items like a rattan room divider or folding screen. Weaving is also key in loungers, easy chairs and loungers: it keeps you cool and adds to the ambiance. Rugs can add to the decor of any room in many different ways. It can pull all of your accent colours together, bring patterns or a neutral spot to the room and soften things up, both visually as in sound. Because a rug is not attached to the floor it’s a lot more versatile than a carpet and can be used to cover up damaged spots. Some rugs by Mica Decorations are even fantastic wall décor in the shape of tapestries. And most of all a rug adds character and soul to a room. Traditionally Berber and Bedouin people use rugs for comfort in their tents as a floorcovering or awning in front. Every rug and every pattern tells a story and adds something warm and vibrant to your home. Modern desert home décor needs clean unfussy lines and just a few fun touches. Think the small shimmer of a gold lizard, a soft fluffy lama or a smooth meerkat. 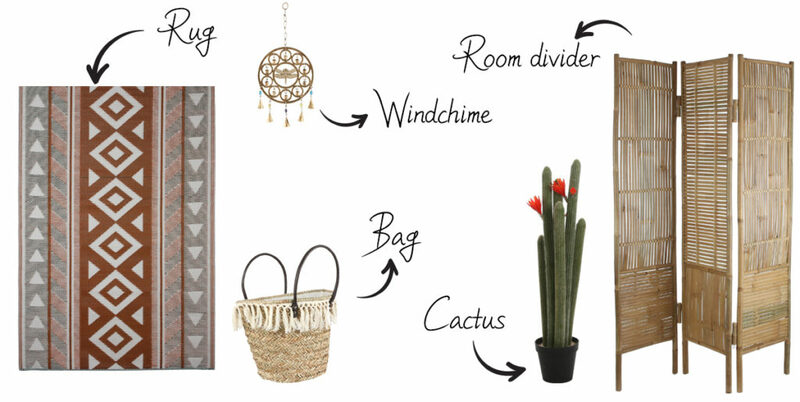 Tribal sticks and wall art emphasize the look, but don’t overdo it: just one wall hanger, rug, tapestry or mirror per wall, the room should be able to breathe and so should you. Plants that thrive in the desert tend to be tough and wiry with small or no leaves. Think cactuses, succulents and hardy Agave and Aloe. Crassula, Hawthoria, Zamioculcas and Sansevieria also go well with this look. A perfect match is Desert rose and Lithops, also known as living stones, unique succulents that look like large pebbles. 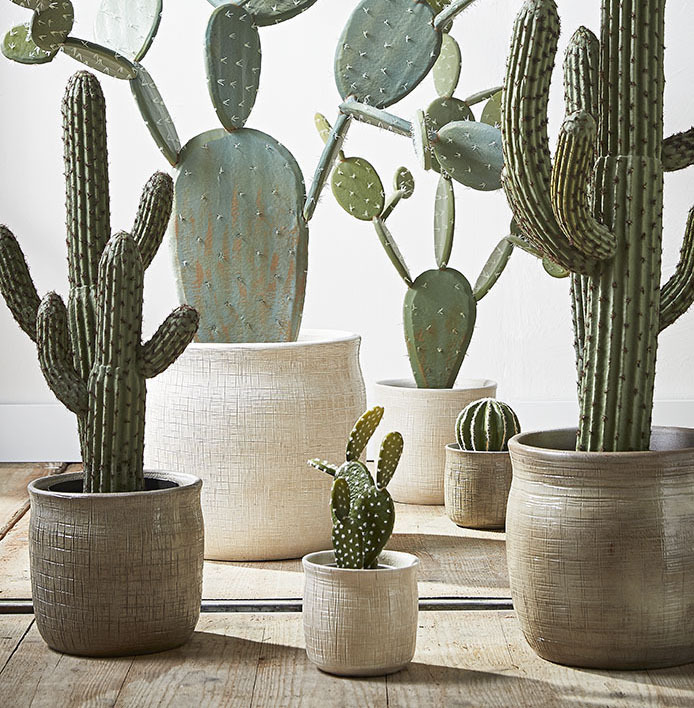 Mica Decorations offers matching pots and bowls in shades and shapes that go well with the desert look. 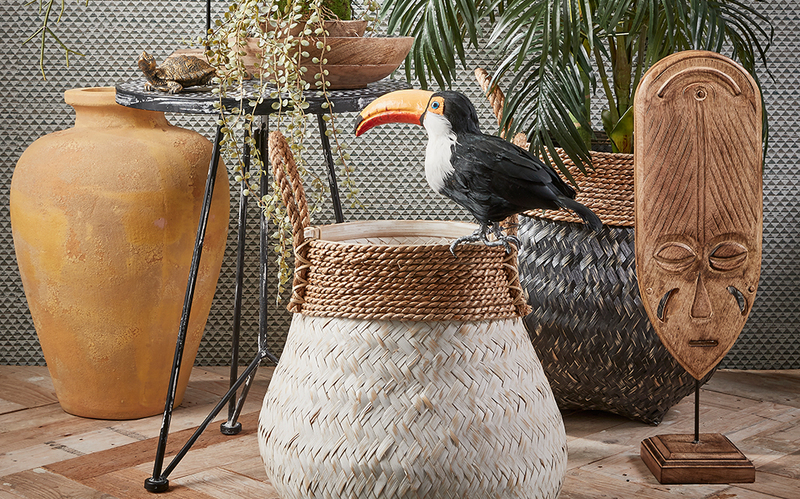 Weave Reed, rattan, metal or wood: baskets and boxes should look like they are woven and are softened up with tassels. Pop of colour Earth tones go well with a pop of colour, like bottle Belinda with a single Heliconia stem. Mood lighting Rattan lamps, hurricane lights and lanterns – there’s the weave element again! – are a great match to brighten up those dusky summer evenings. When it comes to deserts, you can’t get around cactuses, right? These living sculptures are true statement pieces. For the real thing Mica Decorations has sturdy pots in stunning colours, so your desert pet can thrive and become a living heirloom. 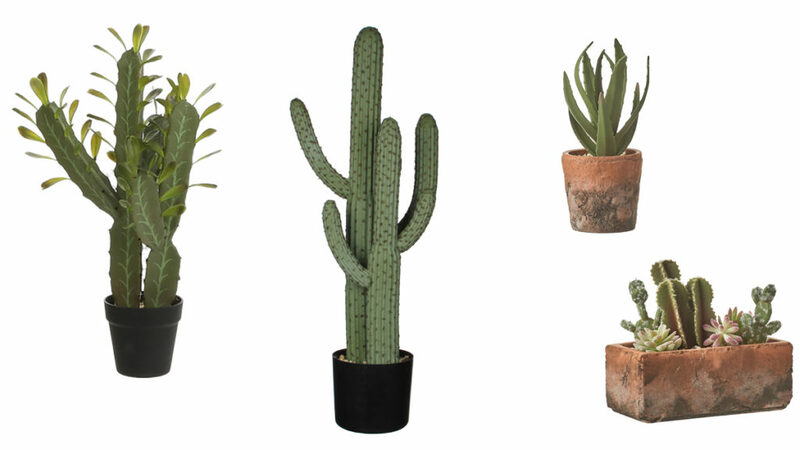 If you prefer care free cactuses Mica offers ample choice In true-to-nature faux specimens and fun decorative ones in glass. Group and match for a great result! For those magical moments when dusk turns to night there’s nothing like enjoying your garden under a starry summer sky, with a few torches, a glass of mint tea and windchimes to keep you company in your very own oasis. Happy summer!